Invest in the only training that teaches people to continuously improve their processes for better customer satisfaction, increased productivity and lower operational costs. ChangeWise are delighted to announce that their Lean Awareness and Team Based Process Improvement training courses have been accredited by the only industry recognised UK authority qualified to certify Lean training for its content and quality. 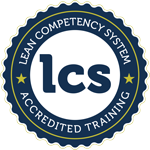 LCS (Lean Competency System) only accredits training that develops the thinking, knowledge and practical skills to enable organisations to implement Lean and Operational Excellence in services and operations. Our blended training and experiential learning approach includes highly participative group activities to allow knowledge and idea sharing; using business simulations, games and practical hands-on experience to give delegates the opportunity to apply their learning. Backed up with clear explanations of the theory in their reference books. The wide-ranging experience of the trainers supports this learning by providing ‘real’ examples from production and service operations. Ongoing coaching develops the skills and practical experience to apply the knowledge appropriately for effective solutions back in the workplace. These are fun, energetic and interactive courses ideal for teams of people to do at the same time.